Last week our family had one of if not the best Big Mac like hamburgers we have ever had. I was reading something somewhere and in came the link to an Executive Chef from McDonald’s. He said “the special sauce recipe has been out for a long time” He took off his professional clothing and switched over to comfortable mode and started taking us through step by step.. how to make a Big Mac, just like they do at McDonald’s. As I watched the video, I started to laugh a little because I thought about how many times I have spoken about the special sauce and thought of this very thing. What is in that Big Mac? Is it thousand island dressing? That is what most people think it is, but it isn’t. What was even more interesting about the making of the Big Mac was that the sauce was only a part of what makes it special after all it is “two all beef patties, special sauce, lettuce, cheese, pickles, onions on a sesame seed bun” Not just that but the buns are toasted, the onion is chopped down into a fine consistency, the pickles are sliced and the lettuce is shredded. It is more than just the sauce, it is the total package. I have wondered why other burger places couldn’t reproduce the Big Mac. Burger King created their “King” burger and others have their own hamburgers with a bunch of different types of sauces. Thing is, there is only one Big Mac! I really have enjoyed my White Castle burgers over the years, they hold a special place in my heart, most likely there is some reminisce left in an artery or two. Outside of the Castle, the only other fast food burger for me (if I have any) is either the Big Mac itself or the dollar menu double cheese burger with the Big Mac sauce with extra onions and pickles. My wife loves to get that for me (not). 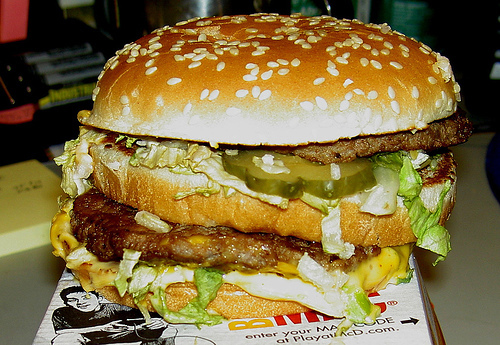 Why all the commotion over the Big Mac? In blog postings past, I have mentioned when it comes to Knowledge Management, Knowledge Transfer and Knowledge Continuity that there is no special sauce. I would like to consider altering this message a little. Maybe there is something special to a person or organizational approach to these areas but even if it is special there is a good chance that it is already out there either reproduced or invented by someone else. It is a known thing, just not known to you. If you choose to go to an organization for a business solution, there is nothing wrong with that. I am suggesting that you consider that they will help you in the same way McDonald’s will. You will get the product and the service you are paying for BUT it isn’t something secret and it isn’t something that will vastly differentiate them in this kind of market. In the case of McDonald’s there is a lot of stuff around the sauce that makes them attractive to consumers. In the case of Knowledge Management, I think it is the same. In other words, if you hire an organization because they have a good KM practice, good ethics, integrity, values, culture and good past performance that in total is what may be the difference between them and the competition. What makes you different from company xyz? I hear that question often. I also see that on the “Shark Tank” show. “You know kid, this isn’t fun and games, its business!” My answer to that is if I had to even make a choice between being a miserable professional or a happy, passionate and giving and loved non-professional business person. I’ll take number 2 for life. If you disagree let us know why. What is the answer you give concerning what makes you different?